Detroit’s Poet Laureate Naomi Long Madgett has shared her time and talents with generations of poets and lovers of poetry during the span of her 93 years. From her girlhood in East Orange, NJ, it was clear that Naomi was destined for the arts: she read poetry avidly, practiced recitation, and published her first poem in the Orange Daily Courier when she was 13. In 1937, her family moved to St. Louis and she attended Sumner High School, the first all-black high school west of the Mississippi. At what she describes as a first-rate school, she discovered that she could be anything her talents could support; the evidence was in the frequent publication of her early work, including her first book only a few days after her graduation. She earned her undergraduate degree from Virginia State College (now University) and moved to Detroit in 1946. She earned her master’s degree (and later a doctorate), and began a career that would include teaching at Northwestern High School and Eastern Michigan University. All the while, she was writing and publishing. Her works of poetry include Songs to A Phantom Nightingale (1941), One and the Many (1956), Star by Star (1965) Pink Ladies in the Afternoon (1972), Exits and Entrances (1978), Octavia and Other Poems (1988), Remembrances of Spring (1993), Phantom Nightingale: Juvenilia (1981), Octavia: Guthrie and Beyond (2002), Connected Islands: New and Selected Poems (2004). In addition to the ten books of her own poetry, Dr. Madgett has edited two poetry anthologies, including the groundbreaking Adam of Ifé: Black Women in Praise of Black Men (2006). She also has written two textbooks, and published her autobiography, Pilgrim Journey (2006). She also has written text books for creative writing. In 1972, she established Lotus Press in order to publish the very best up-and-coming poets as well as established and revered voices. As editor of Lotus Press she has published more than 90 collections. 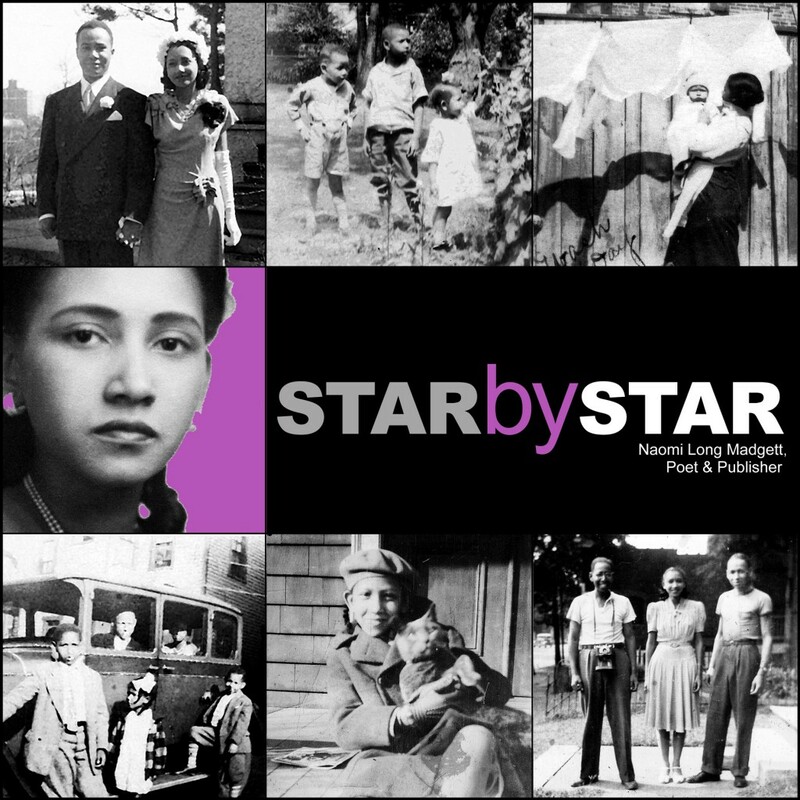 This 82-minute documentary about her life and art– StarbyStar: Naomi Long Madgett, Poet & Publisher–chronicles her journey, her struggles, and her achievements. In conversations with Naomi, we learn about the course of her life and the encouragement she received from Langston Hughes and others of the Harlem Renaissance. Poet, scholar, and friend Melba Joyce Boyd is the interlocutor for the primary film interview. In addition, we hear from poets Herbert Woodward Martin, Toi Derricotte, M.L. Liebler, Terry Blackhawk, Jamaal “Versiz” May, Rhonda Welsh, and Naomi’s daughter, Jill Witherspoon Boyer. We see and hear Naomi in action, giving readings and commentary on her poems. The film is liberally illustrated with photographs and documents. Along the way, we come to understand Dr. Madgett’s prodigious talents, sensibilities, faith, compassion, humor and wit. Filmmaker David B. Schock, Ph.D. is also the creator of Jump Back, Honey: The Poetry and Performance of Herbert Woodward Martin and Strong Words: The Art of Toi Derricotte. We invite you to browse the site, to watch the entire interview between Naomi and her friend and colleague, Melba Joyce Boyd, to watch the trailers for both the film and another work, Four Sisters. There are even extras…additional stories and recommended links…and we will add to these from time to time. And, if you simply MUST have more, please contact the producer: schock@charter.net. And you also can click here to read the release about the award from the Historical Society of Michigan.